A recent report from Gizmodo suggests that the iPad 3 may not actually go by that name. 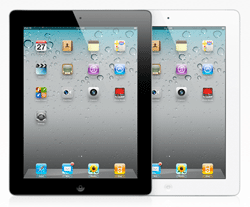 Instead, the third generation tablet may instead be titled the ‘iPad HD’, a name designed to showcase the new Retina display. Gizmodo found what appears to be a part listing from Belkin that says the next gen tablet will not stick to Apple’s traditional naming scheme. ‘HD’ refers to ‘high definition’ since the device will supposedly sport a 2048×1536 resolution. Gizmodo posted the above image, which lists Griffin’s ‘IntelliCase for iPad HD (3)’ and two additional cases. While Griffin is nothing more than a third party accessory provider, it is possible they have correct information. Hey, Otterbox did. According to Gizmodo, however, accessory manufacturers aren’t in the know until the very last minute. Accessories manufacturers don’t have a clue about Apple marketing plans until the very last minute. They usually get the physical specifications for new product versions in advance, so they can have products ready for launch. They also may get information about naming for product packaging, close to the release.